"Less than a 5 minute walk from Bank station, Woolgate is an oasis in the heart of the City, opposite the Guildhall. A contemporary bar with comfortable seating areas and floor to ceiling windows looks out onto a spacious outside seating area. Downstairs our Brasserie and Boardroom offer perfect private areas for large and small events and parties. 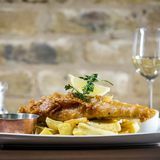 The menu is fresh, seasonal and delicious and drinks include craft beer served straight from copper tanks, premium spirits and an extensive range of wines from Davy’s wine merchants, many of which are available by the glass." 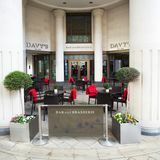 What did you think of Davy's at Woolgate? This bar is Davy's moving into the 21st Century . No sawdust and dusty bottles but smart furniture , atmospheric lighting and modern touches throughout . What you also get of course are great value wines and really good food to go with it . I've become a regular visitor both with chaps from the office and friends after work . The staff are enthusiastic and professional and it genuinely feels that nothing is too much trouble . 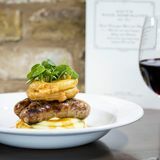 At lunchtime you can grab a steak sandwich or a classy burger in the ground floor bar or you can venture downstairs to the brasserie for a more sophisticated lunch . They obviously have a talented chef in their kitchen if the taste and flavour of the daily specials are anything to go by . I know you can eat from the same menu in the evening if it is an early supper you are looking for. If you’re having trouble getting line managers to sign off entertainment expenses and corporate cutbacks are killing your joy then it’s worth trying a low key alternative with a solid reputation. Step forward, Davys at Woolgate. Despite its size, Davys at Woolgate is surprisingly tricky to locate. Only a minute from Moorgate and scarcely a stone’s throw from London Wall, slipping down Basinghall Street will lead you there. Pleasant views can be enjoyed past neat lawns and pristine pillars – a front terrace offering an easy place to spend an afternoon. Inside, expect laminate as far as the eye can see, a black marble-style bar and plastic-looking booths squashed into the back for dining. Scoop bar stools in crimson and squeaky cream sofas complete the look, which puts style over rather cheap substance. The roomier restaurant downstairs can be held in higher esteem and offers a finer place to enjoy dinner. The party boys start to disappear as the evening wears on whilst more mature City types linger at Davys at Woolgate for a more low key evening. Associates to directors, front to back office, insurance bods, hedge fund managers, and all the other tinkers and tailors of the finance world can be found at this City bar - except for those still caught in the office. Approachable and knowledgeable staff are there to recommend but are backward about coming forward. Ask for suggestions. They know what they’re talking about. A great selection of hot and cold sandwiches start at around £6 - astoundingly reasonable given the area. 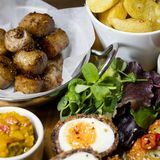 Platters, which also might catch the eye at lunch, include tasty chopped Cumberland sausages (£9.50) and cheese (£7.95) to share. At dinner, goat cheese is accompanied by fresh fig (£5.75) for starters or, to save the cheese until later, try the potted shrimps and thick sour dough toast (£6.95). Plates are quite light to look at but are surprisingly filling. Courgette, lemon and parmesan risotto cakes (£9.95) are heavily buttery and the fresh lemon fails to cut through and cleanse. Rich, juicy sea bass fillets on firm lentils (£13.95) provide more sustenance than anticipated of fish, useful if wishing to test a few tipples. An obligatory cheese plate is spot on for the same reason. The usual spirits and three bottled beers at £4 a go are on offer for those who didn’t come to Davys at Woolgate to drink wine. Rightly, no attention is given to anything else and you should come to this popular purveyor for one thing alone. Davys has its own labeller and these selected wines show off the group’s repertoire and skill. Davys white No 1, for instance, is steely and has a fine dry finish of crisp lime and is one of the better dry whites on the list. The Ardeche is too oaky for an un oaked Chardonnay, but Davys White Burgundy freshens and has a gorgeous buttercup colour. Available in 125 and 175ml sizes from as little as £2.65, there is plenty of opportunity to find something you like. On the red, Davys No 1 is a lively, spicy Grenache and Syrah blend, but better is the Rioja Crianza. If you plough through a great deal of grapes and still don’t find something to suit, the cabinet of fine wines from around £40 is something to move on to. Davys at Woolgate lacks structure and complexity in the decor and ambience, but delivers where it matters on the bottom line. Go for the good food and wine - take absorbing company.